​Excellent service and attention to detail! Wonderful wine cruise through the Bordeaux region. Michelle arranged all the details and suggested the cruise. Superb travel advisor; wonderful trip! Uniworld cruise was absolutely superb in every way. Thanks for the experience. This was the first of what we hope to be several more! There was nothing about our Bordeaux cruise with Uniworld that we disliked. The rooms, the food, the tours, the service were all great. We had an absolutely wonderful time. We had high hopes for the Bordeaux 2014 with the Vineyard Crew and we were not disappointed. Staying the extra day on the front end in Paris was worth every penny. Once on the Ship, everything was perfect. Service was first rate; the excursions were terrific and organized well. The food and wines were excellent, the entertainment fun, AND no bill at the end! Already looking forward to the next one, maybe up the Rhone! Michelle is one of the most professional people I've worked with in any capacity. She has stayed in constant contact with me, and my guests, prior to our trip while advising us on weather conditions, and other necessities to help maximize our enjoyment of the trip. Afterward she followed up with me to make sure all went according to plan. She has won my future business, and the future business of my guests. I have traveled the world, for both business and pleasure, and Michelle is absolutely at the top of her class when it comes to travel planning, execution and follow up. Thank you for all of your help and personal attention! We really enjoyed our anniversary trip to Jamaica. The service was great, and the grounds and hotel were beautiful! You made everything so easy. We can't wait to go back and will definitely be depending on your help to make it happen. Thank you!! Michelle was very helpful and provided excellent service, and very helpful information and advice before we left for our vacation. Her knowledge and expertise really went a long way in making sure everything was taken care of for us. I would definitely use her services again and would gladly recommend her to family and friends!! Michelle is absolutely wonderful! Very helpful and patient as we sorted through all of the information for our 30th anniversary celebration. I will definitely use her for all of my travel needs and recommend her to family and friends!  Planning our trip with MH Signature Journeys was the best thing we ever did. Michelle took care of all the details and we had all the fun! It was an experience we'll always treasure. Thank you, Michelle... can't wait for our next trip! Michelle's travel knowledge and attention to details was instrumental in making our family vacations a huge success. We are very busy professionals who don't have time to plan vacations which are very important to us. It's the only time we get to spend together as a family. We wouldn't think of going anywhere else, and always recommend her!